"Saints preserve us!" Now we can preserve the saints. One of the most outstanding features of the Columbus Chapel are the eight extraordinary 15th and 16th century gessoed-wood statues of saints within the chapel. Unfortunately, the brilliance of their aesthetic beauty has been dimmed by the unrelenting ravages of time. Now, the museum has started on the path to conserving the statues to bring back their beauty without compromising their aged patina. One of the best professionals in the nation has prepared a conservation plan for the statues and all that stands in the way of accomplishing the plan is funding -- some $40,000 of funding. 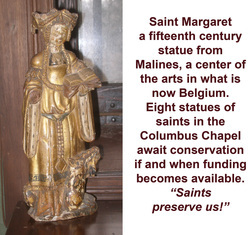 Frankly, what is needed is a patron saint for these patron saints, either an organization with an interest in the Columbus Chapel, or an individual donor who recognizes the aesthetic and educational value of having these statues conserved and available to our community and its school children.